FOR YOUR SAFETY: Casa Azevinho has got the required Alojamente Local (renting licence) already in June 2010, that means all electric infrastructure is made new and proved and there is a yearly proved fire prevention and safety! 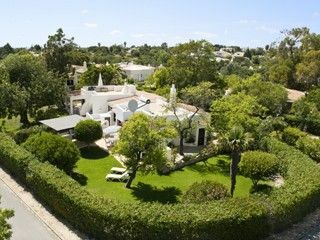 Casa Azevinho is a pretty 2 bedroom villa in a quiet surrounding with distant but nice sea views from the roof terrace. It comprises two bedrooms and one bathroom, a separate WC, lounge with dining area and a fully equipped kitchen. It is located in the Quinta do Paraiso Country Club, a wellknown resort with mini-club, several pools, minigolf and tennis courts, each approximately 350 m away. 1 km to the beach and 4 km to well known golf courses. Many restaurants nearby. The lovely garden (600 m2)is beautiful and offers space for sun and shade seekers. You will find peace and tranquility as well as plenty of activities here. Suitable for everybody but especially for families and golfers. Carvoeiro: The loveliest village in the Algarve with restaurants which are supplied by local fishermen. No high-rises, three golf courses, a number of tennis courts. Several beaches. We are a family with 2 children, and this property was a great choice. The location of the villa was Ideal, with a nice walk into town. The villa itself was delightful with a nice size garden. Definitely consider coming back. Thank you Ian, you and your family are always welcome! Beautiful home and garden :) we had a very comfortable stay. Very quiet at night and very clean. The kitchen is very well equipped with everything you need to cook. We would not hesitate to return! Thank you to our great host. Beautifully maintained house and gardens. A real treat! Perfect break. 50 or so minutes easy drive from Faro, driving past various supermarkets so we could stock up on food on our way from the airport. Beautiful little house and gardens. Able to enjoy pools and tennis courts almost to ourselves (first week in April). Plenty of beaches to visit, can walk to local beach. Good local restaurants, more attractions will open as the season progresses. Children (14,13,10) all very relaxed and also enjoyed the local dive centre. Couldnt ask for more, thank you! What a lovely stay we had at this villa. The villa had every item that we wanted for our stay. A lovely secluded garden tucked away with everything for our relaxing break over Christmas. Good for walks with shopping not to far away. Plus the maid is pleasant and very helpful. yes, Casa Azevinho is a beautiful Villa for all seasons. I am glad that you liked it. Do not hesitate to come to Carvoeiro and Casa Azevinho again. Casa Azevinho a special discovery! We are (the most?) regular visitors to Casa Azevinho as it is without doubt simply our favourite place next to home! It is ideally situated in a lovely quiet resendntial style location with a beautiful secluded, private garden and within an easy stroll down to the beach, cliffs or restuarants. Simply a great place to completely relax and soak up the sun or if unlike us you are keen golfers then there are courses everywhere within easy reach by car. A short stroll finds the excellent pool facilities and an even shorter stroll finds the tennis courts for the more energetic visitor. We would however caution anyone with small children as there is a lovely garden pond which of course has the obvious dangers. Carvoeiro is an old fishing village still with charming places. Situated in the center of the Algarve it offers all possibilities for a marvellous holiday. In and around Carvoeiro there are all sorts of good quality restaurants. Golf: There are two of the best golfcourses in the Algarve only 4 km away: Vale do Pinta and Gramacho; A 9-hole-course is about 5 km away. In a circle of 30 minutes by car you find another 6-7 courses.